"It's like Hamlet said, 'To thine own self, be true." "I think I remember Hamlet correctly." "Well, I remember Mel Gibson accurately, and he didn't say that. That Polonius guy did." The title of this post might suggest a deeper, more soulful introspection into dressing, but alas - I'm just talking about sticking to a uniform. A fit. A style that's so you. 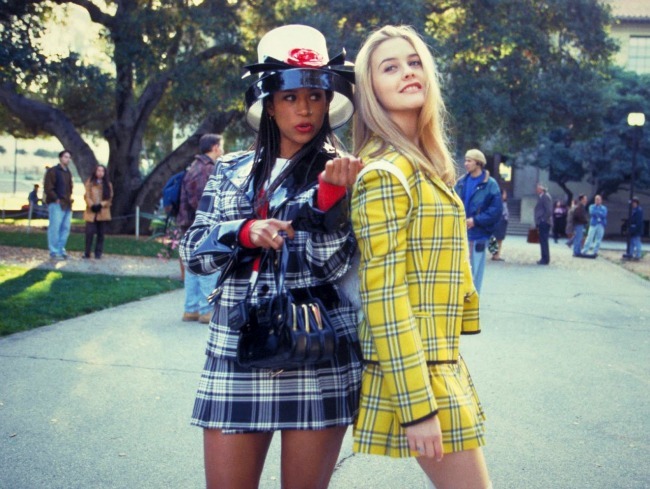 Remember Cher Horowitz? She had a thing for matched sets, plaid and thigh-skimming skirts. She knew what worked and she werked it. Okay, now I am aware that I already have the Madewell ex-boyfriend shirt in two colors (light and dark), but I wear them both at least once a week. I can see this linen wash version being so brilliant for spring with my white Paige jeans and natural-hued sandals. These pointy-toe flats from Zara are different enough to make a great statement with cropped denim or a swishy skirt, and their shape and menswear detailing will keep them in rotation for seasons to come. While I definitely own enough gold jewelry, sunglasses and t-shirts already... Like I said: updates! After seeing TOMOTOM Jewelry at Capsule, I'm obsessed with their bold, linear pieces like this one. Lately, there's a been a huge rise in tongue-in-cheek tees that seem to both mock and praise the designers they imitate, and a favorite of mine is this black "Ain't Laurent Without Yves" shirt. Perfect with distressed jeans and cool, reflective Oakley's, yes? Lastly - this dress. I tried on this little frock on at Urban Outfitters in DC over the weekend, and I was completely obsessed. A low-cut, drop-waist mini actually makes me feel feminine and girly, despite my lack of bodacious curves. In fact, I loved this dress so much I bought it (on sale for $29) in both colors. If you ask me a girl can never have too many LBDs, and one that inspires a new feeling of confidence while also being insanely comfortable? Please. All the details: Sparkle & Fade drop-waist dress / Madewell ex-boyfriend shirt in Linen / Oakley polarized Frogskin sunglasses / "Ain't Laurent Without Yves" tee / Zara slippers / Current/Elliott distressed stiletto jeans / TOMTOM chevron ring. Great post - Nothing like a little Cher in the morning. I'm madly in love w/ those Zara flats, so cute! Argh! Heartbroken that chevron piece is a ring and not a cuff. A cuff would be amazing. And I'm feeling you on sticking to the same silhouette and not venturing too much from it.... maybe that makes my closet like a uniform, but I'm okay with that. Love this - I am just now starting to own my "uniform" of button downs and colored denim. It's what I love, better make the most of it! Nice collection. The black dress is adorable.